Being a writer in this day and age has become much more difficult. Considering the millions of posts published every day (1,999,000+ and counting as of writing according to Worldometers), it is really hard to cut through the noise and drive readers to your articles in troves. Even if you consider your articles as one of your best works, you will have to contend against equally great posts for the attention of your audience. Being able to showcase your uniqueness will help your cause in driving more traffic to your posts. As a professional writer, having a well-established brand will help you gain more clients and build a success blog for your business. 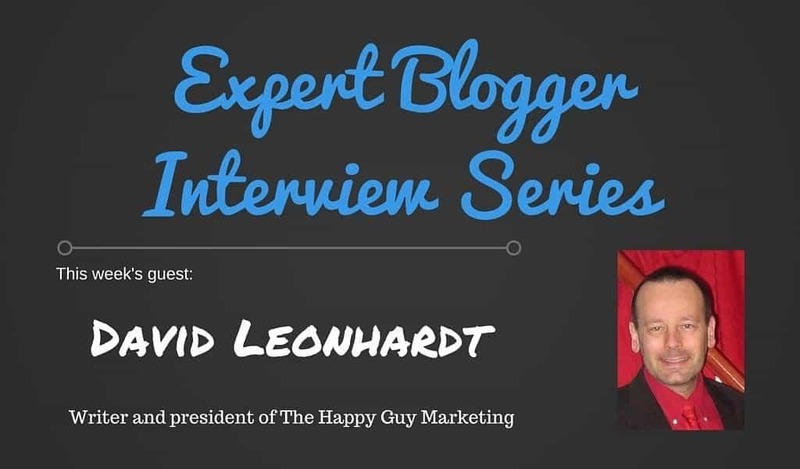 To help you figure out the power of branding, take cue from “Happy Guy” writer David Leonhardt, who was kind enough to answer questions about his journey towards writing and blogging success. Why “the Happy Guy?” Is this your general disposition in life that you share in your writing? Also, how much has happiness helped you in your success? I’m not sure there was a moment. I was always writing articles. At some point, I caved in and created a blog instead of just manually adding article to my website. Blogging was still a new concept back then. I was writing and doing SEO at the time. Not much has changed, except that back then my focus was on SEO with content marketing as a means, and now my focus is on content marketing with SEO as a benefit. I don’t recall there were any beginner blogger obstacles. While my wife was finishing her university degree remotely, I wrote a book Climb Your Stairway to Heaven: the 9 habits of maximum happiness. To support the book, I was to write a magazine column called The Happy Guy (as I said, I was writing articles before I was blogging). One day I was at a BNI meeting in downtown Toronto, and I introduced myself as “The Happy Guy”. Nobody remembered my name, but they all remembered The Happy Guy, so I registered the domain that very afternoon. When I decided to take a more marketing-related direction, The Happy Guy Marketing was just a natural name for the business. Yes! There was the passive-aggressive client a couple years ago who wanted me to write multiple articles on the same dime – a discounted dime at that! My team was ghostwriting posts for a new client. He was fairly explicit as to what he wanted for two posts, which included creative and witty, while still being professional. Perfect! That’s what I do best. One was for his own SEO services and the other was a destination piece for his client, with keywords that did not even fit the topic. He did not know it was me writing them; it was supposed to be one of the ghostwriters on my team, but a scheduling conflict left them in my hands to write. Editor’s note: Below is the conversation between David and the client. The bold text is David and the brown text is the client. gonna need a new write on this one. this is c quality writer. What is it that you would want changed? Perhaps if I rephrase the question…if a new writer was to be handed this, what would you like him to change? The writing style…needs to be eloquent and business professional. So the actual list is OK? The list will change depending on the writer. I would suggest giving this to a fresh writer and have them read the web site, and come up with the ideas on their own, do not restrict them etc. The writing style and the flow is important. I would like to please settle on the list before starting over. If there are items now on the list that you would not want, let’s replace them right away. At this, I rewrote the article in a brand new style, removing a lot of the creative and witty aspects that he had originally asked for, keeping the professional sounding aspect. This is riddled with awkward grammar, incomplete sentences, improper usage of sentence structure, use of passive voice, etc. I have three deadlines due tomorrow, and I do not have time to help people understand how to write properly, or even explain these problems. I am open to either a refund or switching writers if you can submit in 24 hrs? Awkward grammar? Other than what is required to fit in your keywords that don’t quite fit the topic, or to try to sound “business professional” on a topic that is about having fun, can you point out a few examples? Incomplete sentences? I assume you mean sentence fragments. Can you point out any that have not been used properly (you did request business-professional, not academic). I cannot believe you are complaining after the changes we have made. I am just not happy with the writing. I can assure you this writing will not be used. Would you please refund and I will place the order with my other writer? I do respect you as a human being, 110%, I am sure you are a very kind person, very hard working. Working on email is difficult because there is no emotion. But I do know what I need from these two writing orders. I just want to take the hard earned money and spend it with a different writer. So if I understand correctly, after seeking and getting a discount, after receiving top quality articles, after requesting major rewrites and holding back the information required to do so, after receiving those rewrites anyway, after demanding to rewrite from scratch yet again, you are not offering to compensate us for the trouble you put us through? Yes David, requesting a refund, kindly. The most amazing thing is that after this, we went around the block again, as he requested me to rework the SEO-related article which he had already first requested be based on testimonials and then had requested rewritten without testimonials…and was now hoping, after all this, to get a third article out of me for free. Probably the one I wrote in 2003 for SiteProNews, entitled “Google’s Next Big Move”, which launched my SEO career. I got three retained clients through that article. Back in those days, nobody was looking forward; being visionary had no occurred yet to many people. However, if ever one doubted that content marketing can win new clients, that article is the proof. Of more recent posts, I am fond of the “You might be a writer” series. I just enjoy the humor of it. Too many to name. Ann Smarty and Gail Gardner are two whom I have come to love and trust. Good writers, very perceptive, team collaborators. But there are so many others, too. I really do not like writing the same thing as has been written over and over already. I know it is not always possible to be 100 percent unique, but I think my posts are generally pretty unique. I don’t think that makes me better, but it does make me different. WordPress is the main blogging tool. Simply put, it is the most ubiquitous CMS, so there is a plugin available for anything you might wish to add. Digg Digg gives me good, solid social sharing buttons to help with my reach. Viral Content Buzz, Triberr and JustRetweet help amplify my reach on Twitter and elsewhere. Skype is where I connect to my network to ask questions, bounce off ideas, and seek help amplifying the posts when they publish. MyBlogU is also a great tool that I use to generate ideas. Pixabay, StockSnap and Morguefile provide the photo material to create images. PicMonkey and sometimes BeFunky are where I create the images. I measure the success of my main blogs in terms of whether they contribute to my client base, which consists of A) folks who want online writing and hire me because of the reputation I gain through blogging and related social media activities, and B) folks who want books, speeches, articles and other things written and find me through search engines, where I rank because I produce solid content that people like. So, very successful. First, keep it visual, but don’t stop the text. I know there is a move toward podcasts, but if too many people go just to audio or just to audio and video, they will start to lose audiences. This is a multimedia Web, and it will be so for the foreseeable future. Google is increasingly providing how-to tips and lists in the SERPs. Anybody who figures out how to capture the appetite of searchers who want more than just the Google summaries will win big. I am waiting for somebody to start up a blog called “More How-to than Google”. Find a unique voice. Make sure that when people see you or your writing, they right away know it’s you because it just makes sense that it is. That, by the way, is called “branding”. Have your own questions for David? Ask them by commenting below!